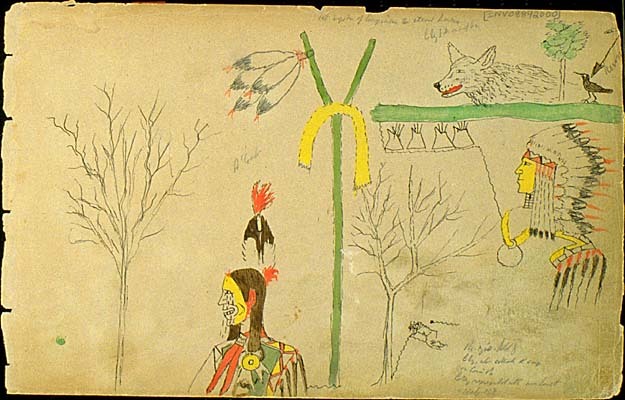 The term Ledger Art comes from the accounting ledger books that were a common source of paper for the Plains Indians during the late 19th century. 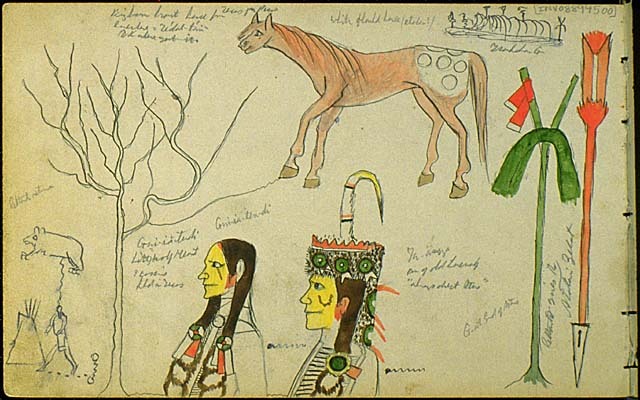 Ledger Art evolved from hide painting techniques. Plains Indians would record historic events on a calendar called the Winter Count. Plains Indian Art emphasizes narrative action, eliminating unnecessary details and backgrounds. The figures tend to be made with hard outlines and are filled with solid fields of colors. With the U.S, Army hunting the buffalo to near extinction (to starve the Native American population), hide was gradually replaced by paper. 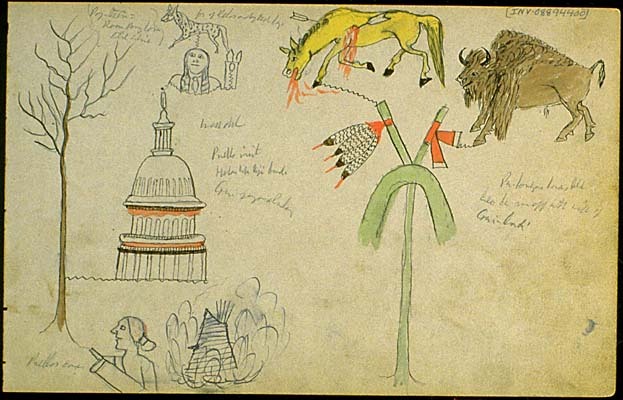 Traders, government agents, missionaries, and military officers introduced new media to the Native Americans, namely pencils, ink, crayons, and watercolors. 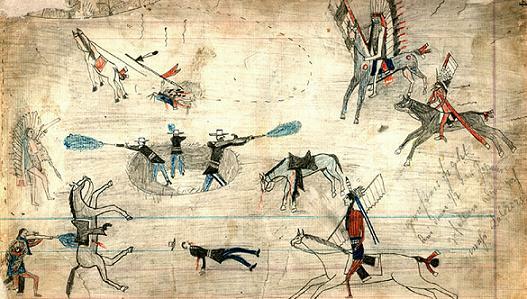 Native American Ledger Art can trace its roots to the mid 1870's, when a band of Southern Plains Indians (Kiowa, Cheyenne, Southern Arapaho) were held at Fort Marion in St. Augustine, Florida. In an effort to improve morale, Captain Richard Henry Pratt began passing out drawing materials and encouraged the prisoners to document their lives. Pratt was progressive in that he believed that Native Americans deserved support and respect, and that they could be assimilated into Anglo-American society, if they would only abandon their old ways. Pratt gave his prisoners English and literacy classes, taught them practical skills, introduced them to Christianity, and gave them an basic education. Today forced assimilation is considered a form of cultural genocide, but Pratt's program was at least a step up from the generally held notion of his time, that all Indians were the enemy, that they were all thieves and murderers in the way of progress, and that they should all be eradicated. Pratt's superior, General Philip Sheridan, dismissed Pratt's beliefs as “Indian twaddle,” but gave him a chance under the pretense that if the program did not work, Pratt would resign his command. Pratt's education program worked, particularly the Art Project. Visitors to the fort would purchase the drawings, and the proceeds would go directly to the artists. Eventually the prisoners at Fort Marion were released back into society. Historically, Ledger Art was exclusively by men. In Plains Indians culture, the men would create all the narrative, representational art, recording historical events and such, while the women would make the abstract and geometrical designs. 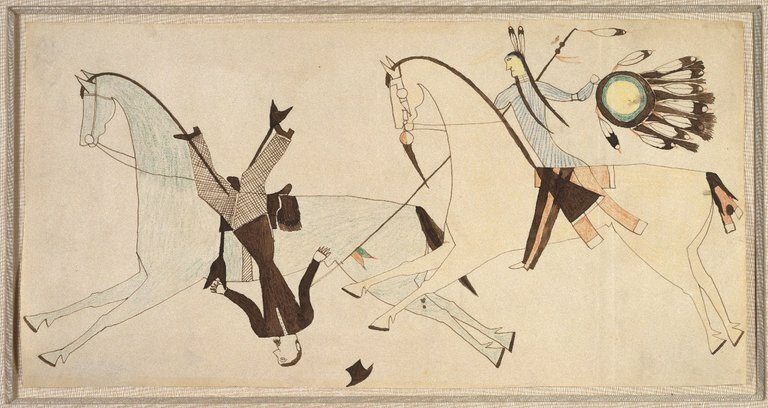 Ledger Art often depicts warfare, stealing horses, and hunting, occasionally showing courtship scenes, mythology, and religious practices. Ledger artists also depicted their rapidly changing environment, portraying encroaching European Americans and new technologies such as trains and cameras. Amos Bad Heart Bull (Oglala Lakota) – Born c 1868, Amos Bad Hear Bull was a witness to the Battle of Little Bighorn, known to the Native American participants as the Battle of the Greasy Grass, where Colonel George Armstrong Custer's 7th Calvary was massacred. At the conclusion of the Great Sioux War in 1877, the Bad Heart Bull clan surrendered at the Red Cloud Agency, where he witnessed the death of Crazy Horse. Amos Bad Heart Bull documented both of these events in his art. In 1890, Amos Bad Heart Bull enlisted in the U.S. Army as a scout and learned English while stationed at Fort Robinson. 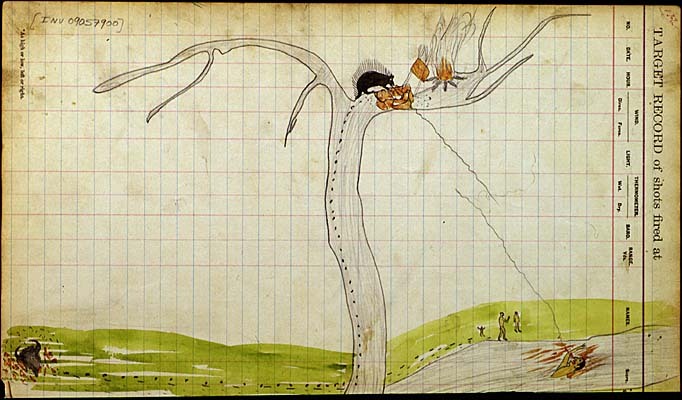 He purchased his first ledger book in nearby Crawford, Nebraska, and began filling it with drawings. After his service, Amos Bad Heart Bull became the Oglala's historian, continuing the tradition of the Winter Count. He buried his wife and his young daughter before dying himself in 1913, at the age of 45. Howling Wolf (Cheyenne) – Howling Wolf was a witness to the Sand Creek Massacre of November 29th, 1864, where 700 Colorado Militiamen attacked a peaceful village of Cheyenne and Arapaho, killing and then mutilating the bodies of some 160 people, most of whom were women and children. Colonel John Milton Chivington, commander of the militia, would say of the event, “Damn any man who sympathizes with Indians! ... I have come to kill Indians, and believe it is right and honorable to use any means under God's heaven to kill Indians.” Later, while imprisoned at Fort Marion in 1875, Howling Wolf would record the Sand Creek Massacre on paper. Released from Fort Marion in 1878, he tried to assimilate into Eastern life, but quickly became disillusioned and returned to the Cheyenne reservation in Oklahoma. In 1881 Howling Wolf returned to the traditional Cheyenne ways and became a prominent member of the new Native American Church. Howling Wolf died in 1927 in a car accident while on his way home to Oklahoma after performing in a Wild West show in Houston, Texas. Kicking Bear (Oglala Lakota) – Kicking Bear fought at the Battle of Little Bighorn (Battle of the Greasy Grass) alongside his first cousin Crazy Horse. Kicking Bear was also a holy man active in the Ghost Dance religious movement of 1890, which was suppressed at the Wounded Knee Massacre. Following the murder of Sitting Bull, Kicking Bear was imprisoned at Fort Sheridan in Illinois. Upon his release in 1891, he joined Buffalo Bill Cody's Wild West Show and toured Europe for a year. He found the experience humiliating and left, returning to the Pine Ridge Reservation to care for his family. 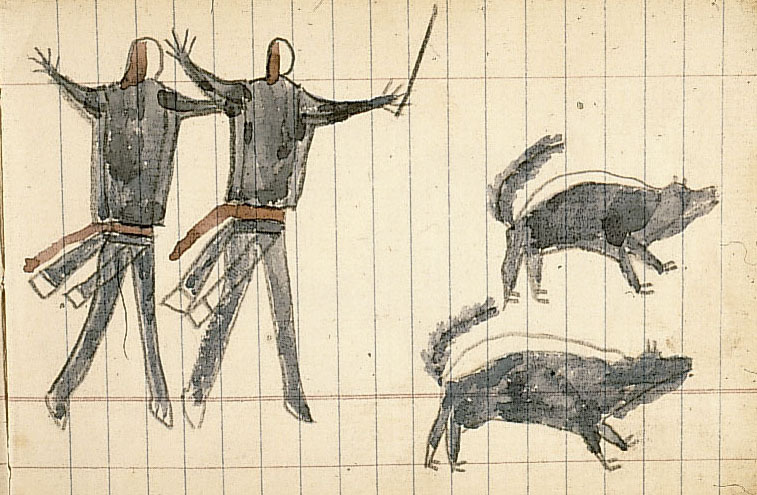 At the request of artist Frederic Remington, Kicking Bear recorded his account of the Battle of Little Bighorn in 1898. Squint Eyes (Cheyenne) – Squint Eyes began drawing while a prisoner at Fort Marion, St. Augustine, Florida. He is one of the few Fort Marion prisoners who continued to make art after his release. Upon his release from Fort Marion in 1878, Squint Eyes trained as a Naturalist at the Hampton Institute in Virginia, before finding employment at the Smithsonian. 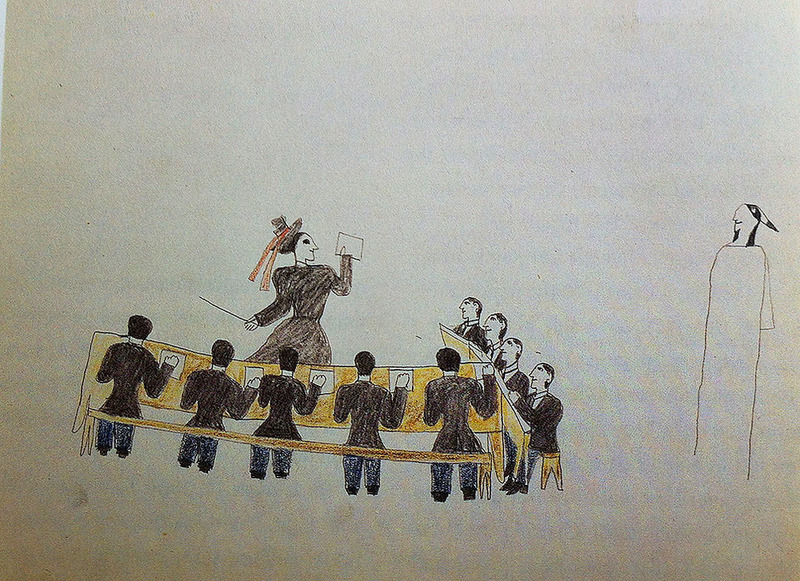 One of the drawings below, made by a Fort Marion prisoner, possibly Squint Eyes, shows a woman teaching. The Natives were at first uncomfortable with women teachers, but quickly accepted the situation. Off to the right, a ghost figure observes. Unfortunately, no photo of Black Hawk exists. Black Hawk (Sans Arc Lakota) – Black Hawk was the chief medicine man of the Sans Arc Lakota. He is best known as the artist who, in 1880–1881, produced a set of 76 ledger drawings for William Edward Caton, the federal Indian trader at the Cheyenne River Indian Reservation. 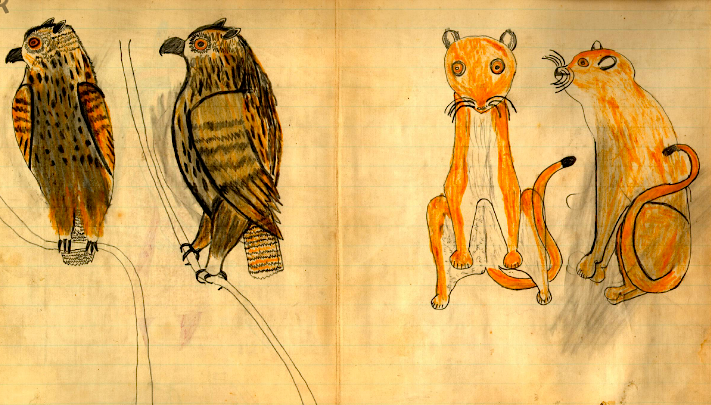 The drawings depict Lakota life, wildlife, and spiritual beings in Lakota mythology. 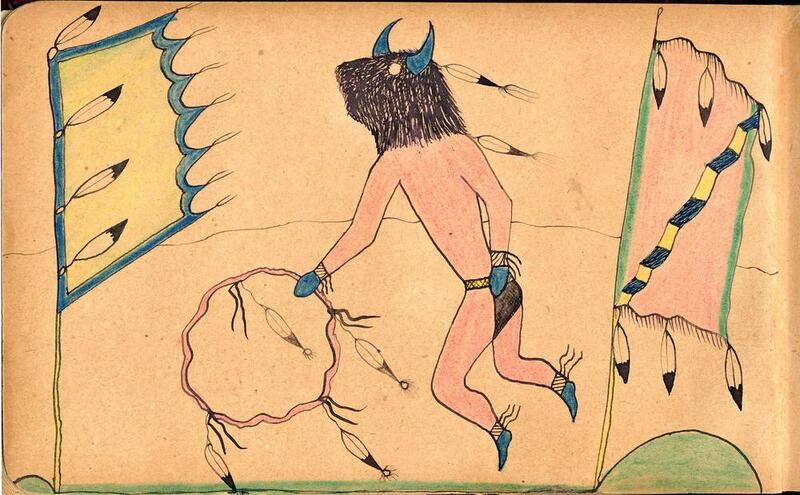 One drawing shows the horned Thunder Being on a horse-like creature with eagle talons and buffalo horns. The creature's tail becomes a rainbow, which represents the entrance to the Spirit World, and the dots on the horse represents hail. Black Hawk entitled the drawing “Dream or Vision of Himself Changed to a Destroyer and Riding a Buffalo Eagle.” Black Hawk had difficulty feeding his family during the winter of 1880-1881, and gave Caton the drawings at 50 cents apiece in exchange for store credit. Black Hawk is thought to have been killed at the Wounded Knee Massacre of 1890. Silver Horn (Kiowa) – Born in 1860 in Southwestern Oklahoma, Silver Horn came from a long line of Kiowa Calender Keepers, who recorded the tribe's history in art. Between 1870 and 1920, Silver Horn produced over a thousand drawings depicting Kiowa culture, including warfare, coup counting, the Sun Dance, and early representations of Peyote religion. Silver Horn began making Ledger Art while a prisoner at Fort Marion and met with some success in the art world after his release in 1878. Like his fellow artist-prisoner, Squint Eyes, Silver Horn would go on to work for the Smithsonian. Silver Horn was influential on the Kiowa Six group, who showed at the Venice Beinnale in 1932. Red Horse (Miniconjou Sioux) – Red Horse was a Lakota Sioux sub-chief and a witness to the Battle of Little Bighorn. 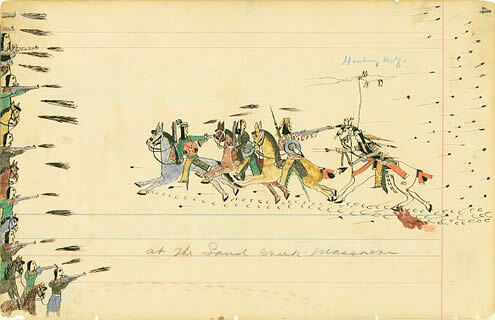 He recorded his account of it at the Cheyenne River Reservation in 1881 in a series of 41 drawings. Following the battle, reporters were eager to interview Red Horse, whose account of the battle is considered important as there were no U.S. Army survivors from the battle, Custer's command being annihilated. 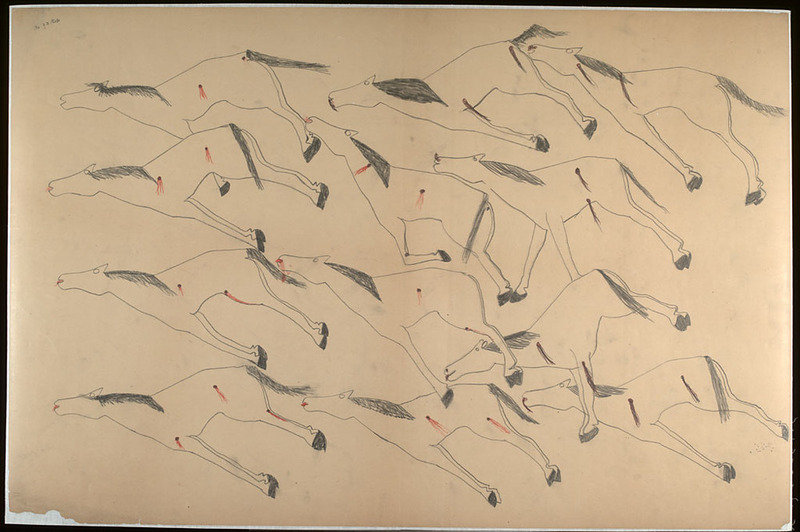 Red Horse's drawings depict the dismemberment and mutilation of the 7th Calvary soldiers. The Plains Indians believed that in the afterlife, the soldiers would also be dismembered and mutilated. To be fair, the Indian Wars was a savage affair, and atrocities occurred on both sides. The U.S. Army was also guilty of desecrating the dead, such as at the Sand Creek Massacre in 1864. 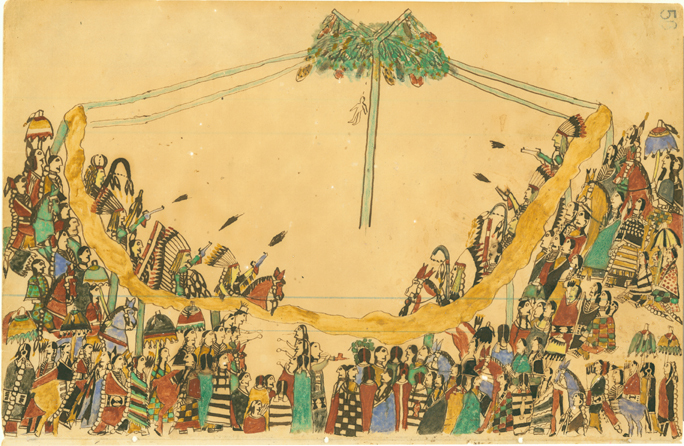 Starting in the 1960's, there was a revival of the Ledger Art tradition among Native American artists, notably Terrance Guardipee, Michael Horse, John Pepion, Dolores Purdy Corcoran, and Eddie Encinas. 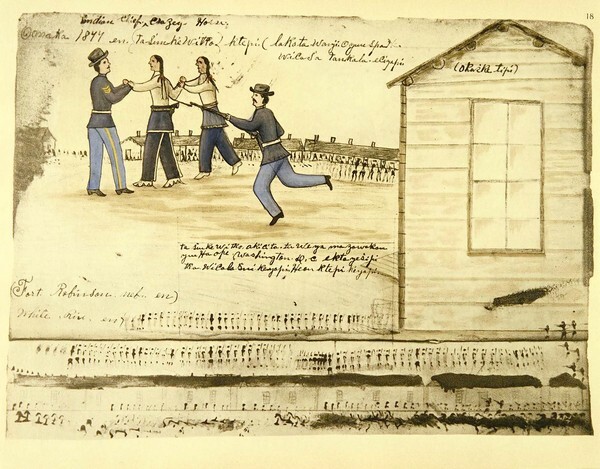 In some cases, the artists purchase dated paper and documents to draw on, often using the medium to comment on contemporary Native American issues.